Coral communities are changing rapidly worldwide through loss of coral cover and shifts in species composition. Although many reef-building corals are likely to decline, some weedy opportunistic species might increase in abundance. Here we explore whether the reshuffling of species can maintain ecosystem integrity and functioning. Using four common Caribbean reef-building coral genera we modeled rates of reef construction and complexity. We show that shifting coral assemblages result in rapid losses in coral-community calcification and reef rugosity that are independent of changes in the total abundance of reef corals. These losses are considerably higher than those recently attributed to climate change. Dominance patterns of coral assemblages seem to be the most important driver of the functioning of coral reefs and thus, the future of these ecosystems might depend not only on reductions of local and global stressors, but also on the maintenance of keystone coral species. 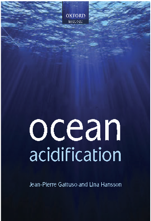 The ecological effects of ocean acidification (OA) from rising atmospheric carbon dioxide (CO2) on benthic marine communities are largely unknown. We investigated in situ the consequences of long-term exposure to high CO2 on coral-reef-associated macroinvertebrate communities around three shallow volcanic CO2 seeps in Papua New Guinea. The densities of many groups and the number of taxa (classes and phyla) of macroinvertebrates were significantly reduced at elevated CO2 (425–1100 µatm) compared with control sites. However, sensitivities of some groups, including decapod crustaceans, ascidians and several echinoderms, contrasted with predictions of their physiological CO2 tolerances derived from laboratory experiments. High CO2 reduced the availability of structurally complex corals that are essential refugia for many reef-associated macroinvertebrates. This loss of habitat complexity was also associated with losses in many macroinvertebrate groups, especially predation-prone mobile taxa, including crustaceans and crinoids. The transition from living to dead coral as substratum and habitat further altered macroinvertebrate communities, with far more taxa losing than gaining in numbers. Our study shows that indirect ecological effects of OA (reduced habitat complexity) will complement its direct physiological effects and together with the loss of coral cover through climate change will severely affect macroinvertebrate communities in coral reefs. Ocean acidification threatens the foundation of tropical coral reefs. This study investigated three aspects of ocean acidification: (i) the rates at which perforate and imperforate coral-colony skeletons passively dissolve when pH is 7.8, which is predicted to occur globally by 2100, (ii) the rates of passive dissolution of corals with respect to coral-colony surface areas, and (iii) the comparative rates of a vertical reef-growth model, incorporating passive dissolution rates, and predicted sea-level rise. By 2100, when the ocean pH is expected to be 7.8, perforate Montipora coral skeletons will lose on average 15 kg CaCO3 m−2 y−1, which is approximately −10.5 mm of vertical reduction of reef framework per year. This rate of passive dissolution is higher than the average rate of reef growth over the last several millennia and suggests that reefs composed of perforate Montipora coral skeletons will have trouble keeping up with sea-level rise under ocean acidification. Reefs composed of primarily imperforate coral skeletons will not likely dissolve as rapidly, but our model shows they will also have trouble keeping up with sea-level rise by 2050. The potential interactive effects of iron (Fe) limitation and Ocean Acidification in the Southern Ocean (SO) are largely unknown. Here we present results of a long-term incubation experiment investigating the combined effects of CO2 and Fe availability on natural phytoplankton assemblages from the Weddell Sea, Antarctica. Active Chl a fluorescence measurements revealed that we successfully cultured phytoplankton under both Fe-depleted and Fe-enriched conditions. Fe treatments had significant effects on photosynthetic efficiency (Fv/Fm; 0.3 for Fe-depleted and 0.5 for Fe-enriched conditions), non-photochemical quenching (NPQ), and relative electron transport rates (rETR). pCO2 treatments significantly affected NPQ and rETR, but had no effect on Fv/Fm. Under Fe limitation, increased pCO2 had no influence on C fixation whereas under Fe enrichment, primary production increased with increasing pCO2 levels. These CO2-dependent changes in productivity under Fe-enriched conditions were accompanied by a pronounced taxonomic shift from weakly to heavily silicified diatoms (i.e. from Pseudo-nitzschia sp. to Fragilariopsis sp.). Under Fe-depleted conditions, this functional shift was absent and thinly silicified species dominated all pCO2 treatments (Pseudo-nitzschia sp. and Synedropsis sp. for low and high pCO2, respectively). Our results suggest that Ocean Acidification could increase primary productivity and the abundance of heavily silicified, fast sinking diatoms in Fe-enriched areas, both potentially leading to a stimulation of the biological pump. Over much of the SO, however, Fe limitation could restrict this possible CO2 fertilization effect. Ocean acidification is projected to shift coral reefs from a state of net accretion to one of net dissolution this century. Presently, our ability to predict global-scale changes to coral reef calcification is limited by insufficient data relating seawater carbonate chemistry parameters to in situ rates of reef calcification. 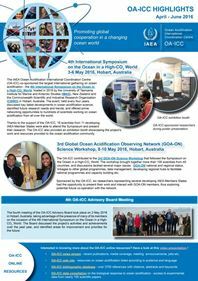 Here, we investigate diel and seasonal trends in carbonate chemistry of the Davies Reef flat in the central Great Barrier Reef and relate these trends to benthic carbon fluxes by quantifying net ecosystem calcification (nec) and net community production (ncp). Results show that seawater carbonate chemistry of the Davies Reef flat is highly variable over both diel and seasonal cycles. pH (total scale) ranged from 7.92 to 8.17, pCO2 ranged from 272 to 542 μatm, and aragonite saturation state (Ωarag) ranged from 2.9 to 4.1. Diel cycles in carbonate chemistry were primarily driven by ncp, and warming explained 35% and 47% of the seasonal shifts in pCO2 and pH, respectively. Daytime ncp averaged 37 ± 19 mmol C m−2 h−1 in summer and 33 ± 13 mmol C m−2 h−1 in winter; nighttime ncp averaged−30 ± 25 and −7 ± 6 mmol C m−2 h−1 in summer and winter, respectively. Daytime nec averaged 11 ± 4 mmol CaCO3 m−2 h−1 in summer and 8 ± 3 mmol CaCO3 m−2 h−1 in winter, whereas nighttime nec averaged 2 ± 4 mmol and−1 ± 3 mmol CaCO3 m−2 h−1 in summer and winter, respectively. Net ecosystem calcification was highly sensitive to changes inΩarag for both seasons, indicating that relatively small shifts in Ωarag may drive measurable shifts in calcification rates, and hence carbon budgets, of coral reefs throughout the year. Coral reefs and the services they provide are seriously threatened by ocean acidification and climate change impacts like coral bleaching. Here, we present updated global projections for these key threats to coral reefs based on ensembles of IPCC AR5 climate models using the new Representative Concentration Pathway (RCP) experiments. For all tropical reef locations, we project absolute and percentage changes in aragonite saturation state (Ωarag) for the period between 2006 and the onset of annual severe bleaching (thermal stress >8 degree heating weeks); a point at which it is difficult to believe reefs can persist as we know them. Severe annual bleaching is projected to start 10–15 years later at high-latitude reefs than for reefs in low latitudes under RCP8.5. In these 10–15 years, Ωarag keeps declining and thus any benefits for high-latitude reefs of later onset of annual bleaching may be negated by the effects of acidification. There are no long-term refugia from the effects of both acidification and bleaching. Of all reef locations, 90% are projected to experience severe bleaching annually by 2055. Furthermore, 5% declines in calcification are projected for all reef locations by 2034 under RCP8.5, assuming a 15% decline in calcification per unit of Ωarag. Drastic emissions cuts, such as those represented by RCP6.0, result in an average year for the onset of annual severe bleaching that is ~20 years later (2062 vs. 2044). However, global emissions are tracking above the current worst-case scenario devised by the scientific community, as has happened in previous generations of emission scenarios. The projections here for conditions on coral reefs are dire, but provide the most up-to-date assessment of what the changing climate and ocean acidification mean for the persistence of coral reefs.